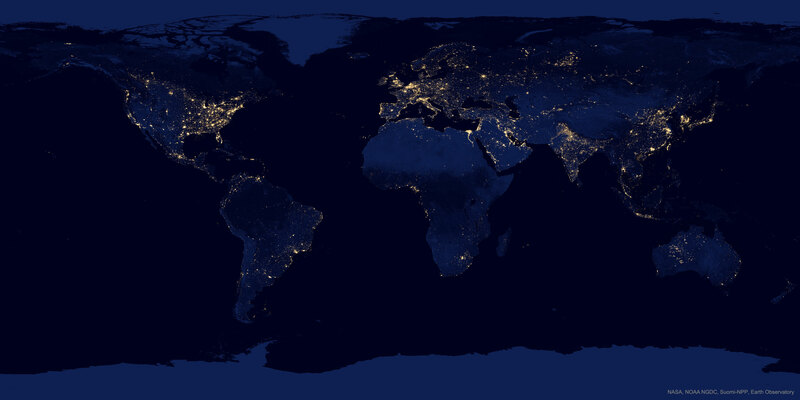 One of the most beautiful things to see from space, apart from storms or auroras, is to see the Earth itself at night. Looking at the Earth at night offers not only, as I said, a light show created by man, but also allows us to observe the advanced civilization to which we belong and, also, the differences between countries and continents. Lights means electricity, electricity means energy or obtaining easy and cheap energy, energy means development. Countries with more advanced cities “look” more, while those that do not shine are related to deficiencies. For that reason (which is not the only one) Africa is “off” while Europe shines. It also allows us to see populated areas, such as Japan, central Europe, Beijing, New York, Mexico City, or Sao Paulo and Rio de Janeiro that light up like Christmas trees. Although quiet, the dark areas are not only due to underdeveloped areas but also to forests or complicated areas to inhabit, such as the Amazon, Alaska or the desert area of ​​Africa. A true spectacle in which we can draw many results depending on what we seek: from beauty to migratory movements or even the movement of information on our planet.